A signed, limited edition, digital print, taken from an original acrylic painting. 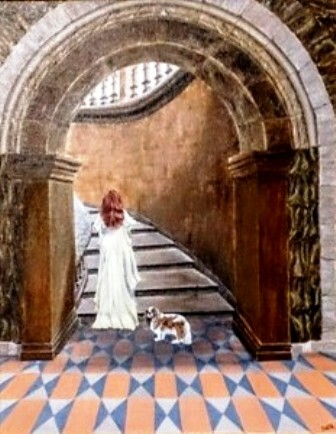 Showing the young queen Victoria with her spaniel, Dash, climbing the staircase to the garden. The print has a signed Certificate of Authentication on the reverse, and comes complete with a cream mount. Size 20" x 16". As with all prints, do not hang in direct sunlight.